Will dogs behave selflessly for the good of another dog? Researchers at the University of Veterinary Medicine in Vienna recently performed an experiment to put this question to the test. While altruistic, or prosocial, behavior has been demonstrated in animals that are closely related to humans, like primates, and in the relationship between dogs and humans, it had not been extensively studied in dogs’ interactions with other dogs. 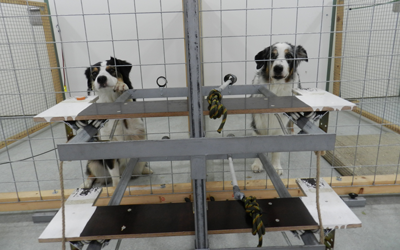 In the experiment, two dogs were placed side-by-side in cages. One of the dogs had control of two trays, one of which contained a treat, and the other of which did not. The first dog (or donor dog) was able to decide whether to pull the tray with the treat or the tray with nothing towards the other dog. The dog donating the treat did not receive a treat themselves. The researchers performed control tests to ensure that the experiment was valid. To prove that the donor dog understood the results of pulling the treat tray, they offered the donor dog the opportunity to choose a tray and reward themselves with a treat. The donor dog did so every time, indicating that they weren’t just selecting a tray at random, but that they understood what pulling a specific tray meant. What the researchers found was that dogs were willing to behave altruistically, but that the familiarity of the dog mattered. Dogs were willing to give treats to other dogs, even if they themselves didn’t benefit, but they were more likely to give a treat to dogs they knew than dogs they weren’t familiar with. This study was relatively small, comprising of only 16 dogs, but the results are a promising start for further research into altruistic behavior in dogs. Did this study leave you feeling all warm and fuzzy inside? Here are 22 dog best friends from Buzzfeed to warm your heart even further.